Friday again already? Time flies. After listening to the Now Show on BBC Radio 4 earlier, followed by reading my news and blog subscriptions it is now time for some Islay blogging. The Friday Islay Picture to be precise. Last week I had the picture of an Islay sunset, so I thought why not another sunset? This time it's not a summer solstice sunset though, this is the sun about to set behind The Oa in late October 2007. It had been a fairly cloudy and grey day, but late in the afternoon the clouds started to break up. One of the nice views I had then was the one above. That's obviously a Calmac ferry in Port Ellen in the foreground. 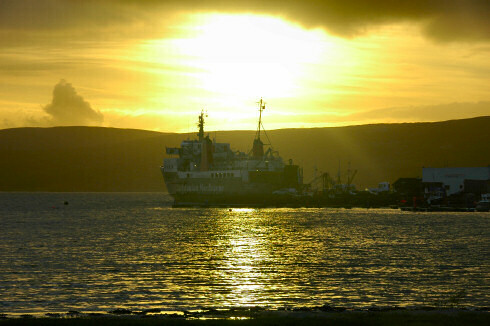 Which reminds me of the Islay Lifeline Ferry Services entry from last Friday. You might want to revisit the BBC page I had blogged about then: When the boat comes in. Since I first blogged it a week ago a video which ran on the BBC Breakfast show on Wednesday has been added. So what about plans for the weekend? The weather forecast for Reading doesn't look too bad. Slightly better than Islay, which has recently seen some long overdue rain (and will likely see more over the weekend). So apart from hoping to get out a bit I'm planning to finalise the bookings for my upcoming holiday in Argyll and on Islay. I also need to make some progress in learning how to use my digital video camera. In other words, a busy weekend ahead for me. How about yours? Whatever your plans are, have a great weekend!